Of course, it's full of action: it's a Jerry Bruckheimer film. And, although the bombing, flying, running, exploding segments are magnificent, the happy and/or sad tale(s) of love gone right or wrong leave one as uninvolved and unconcerned as is imaginably possible. It might be 1941 onscreen, but times have changed and the "Burt Lancaster/Deborah Kerr effect" doesn't quite do it for the new millennium guy or gal. Depending upon American patriotic sympathies to involve audiences (NB- the film opened in the United States on Memorial Day weekend) was perhaps a misplaced sentiment for Jerry B. to harbor. Or should we lay the main blame on writer Randall Wallace or director Michael Bay for this mega-misser? The invasion and attack carry the best part of the film, but the characters mincing around to create a tale of humanity, love and dedication make one wonder why they couldn't be brave enough to get blown up earlier in the proceedings and save the viewer some misery. Before getting carried away with the shortcomings of the romantic side of the story, however, it must be emphasized once again that the surprise attack has been realized with such technical expertise that it far surpasses any previously filmed version of the event. It will startle the viewer with an effect that makes that terrible day in history come as close as possible to our own experience and make it more comprehensible than it might otherwise have been. No school textbook will render it as vividly as this film. For the actual invasion in 1941, twenty submarines and five midget subs followed by a combined fleet of two battleships, three cruisers, eleven destroyers, six carriers, eight tankers, three submarines and four hundred twenty three planes left Tankan Bay in Japan for the mission in Hawaii. Once located near their destination, the aircraft began their attacks in waves: a total of 350 Zeros, Kates and Vals filled the skies during the attack. 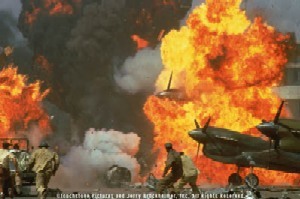 The logistics of filming this air attack were immense because not only did it have to recreate the illusion of the original invasion, but manage to keep the authentic planes used in the making of the film both undamaged and unscathed. Not an easy trick. Nurses (who usually enjoy the sun in a tropical paradise where the run-of-the-mill injury is a sunburned behind) suddenly confronted by the bloodied and battered bodies of young soldiers. The necessity of creating an intimate story to bind together the events of that fateful day flew off in the wrong direction by attempting to recreate "ordinary people" in extraordinary circumstances. It might, for example, have been more interesting (and involving) to delve deeply into the lives of those at the helm on both sides of the not-so-Pacific Ocean and investigate their personal mistakes as well as their acts of courage more thoroughly. Writer Wallace and director Bay may have spent considerable time arranging meetings and listening to the stories of octogenarians who experienced the actual event, but they didn't come up trumps with a story line. The Americans were honorable people who wanted to keep their country out of war. There was an oil embargo against Japan and the Japanese were honorable people who felt threatened by the Americans. War demands a constant reassessment of tactics and somebody should have been on their toes following situations as they developed. An astounding lack of communication was partially responsible for the devastating results of this Japanese attack, inasmuch as nobody on the American side was adequately prepared for it, despite numerous warnings from various members of staff. The men running the real show were convinced that, despite the fact that the fleet was based in an extremely vulnerable position, Pearl Harbor could not conceivably become a target. This makes the story not only an epic, but also the result of epic miscalculations. This material is covered in the framework of the film, but is never allowed surreptitiously to subvert the central romantic story. Tennessee born Rafe McCawley (Ben Affleck) and Danny Walker (Josh Hartnett) leave their childhood crop-dusting antics behind in clouds of smoke for hopes of becoming pilots with the U.S. Army Air Corps. Danny's father still has terrible memories of World War I, but these have not deterred his son from following a similar course. Rafe falls in love with Navy nurse Evelyn Johnson (Kate Beckinsale), who has approved his application as pilot. Rafe has the opportunity to join Eagle Squadron and fight alongside the English, Canadians, Australians and Swedes who are already actively involved in the war. 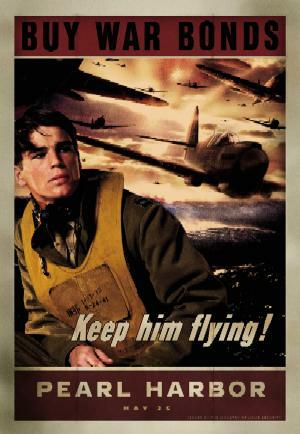 Both Danny and Evelyn (now McCawley's squeeze) are worried about Rafe's dangerous endeavors over the English Channel in the Battle of Britain. Well, anything could happen; after all, it is wartime. As the thin plot thickens, Evelyn finds herself becoming unexpectedly involved with Danny and this situation causes all sorts of complications. To tell more, would leave the romantic tale devoid of any remaining interest. The performances of Affleck, Hartnett, and Beckinsale are all first rate, but the material they are expected to bring to life is as interesting as a dead fish floating in a bombed-out bay. The actors have done their best, but against epic odds. It is, however, with this wartime tale that Josh Hartnett finally becomes a star. After showing his talent in several films, including "The Virgin Suicides", he has sprung with a giant leap into the role of leading man for this tale of a fictional trio with a bomb-dropping background. The visual aspects of the movie owe a great deal to the work of production designer Nigel Phelps as well as the costume designer Michael Kaplan and the numerous make-up artists (normal and prosthetic) involved in the production. All their efforts are enhanced by DP John Schwartzman (A.S.C.) shooting in Technicolor. Films about war find themselves in a sensitive territory, especially if the war has taken place in living memory. The situation on both sides (American and Japanese) is dealt with here in as broad a scope as possible within the confines of filmmaking. Bruckheimer explains that, when survivors and their families were brought to the location, "We'd watch adult children dumbfounded as their fathers spoke. They'd recount their tragic memories. On more than one occasion you would hear people whisper that through the years their father had refused to speak of his experience or that they simply never knew what their parent had gone through. There were a lot of tears from both generations". He also reflects that, "The great thing about making movies like this is that it affords us the ability to become involved in incredibly interesting subject matter", adding that "You research the subject, you talk to survivors, you read, you listen to old radio broadcasts and watch other films and documentaries. You educate yourself. And then you do your best to come up with a screenplay that's romantic, entertaining, humorous, and yet has depth and pathos, and shows the tragedy that so many families went through. We tried to encompass all of that in Pearl Harbor. We tried to be accurate, but it's certainly not meant to be a history lesson". The narration during the closing minutes of the film drips like syrup, declaiming the spirit of patriotism found among the men and women who took part in this event. (Especially amazing considering the circumstances leading up to it.) It would seem that when mistakes are made and lives are unnecessarily lost, a sweeping proclamation of patriotism will suffice to right all wrongs. When all is said and done, the romance, humor, depth, and pathos all take second place to the action. Splash on the red lipstick and bob your hair, pull on the uniforms and spruce yourself up, but remember: it don't mean a thing if it ain't got that swing. Bruckheimer had about as much chance in succeeding to captivate an audience with the love story portion of this film as an American soldier would have had combating the Japanese in Hawaii on a December Sunday morning in 1941. No top guns; just bombs away.